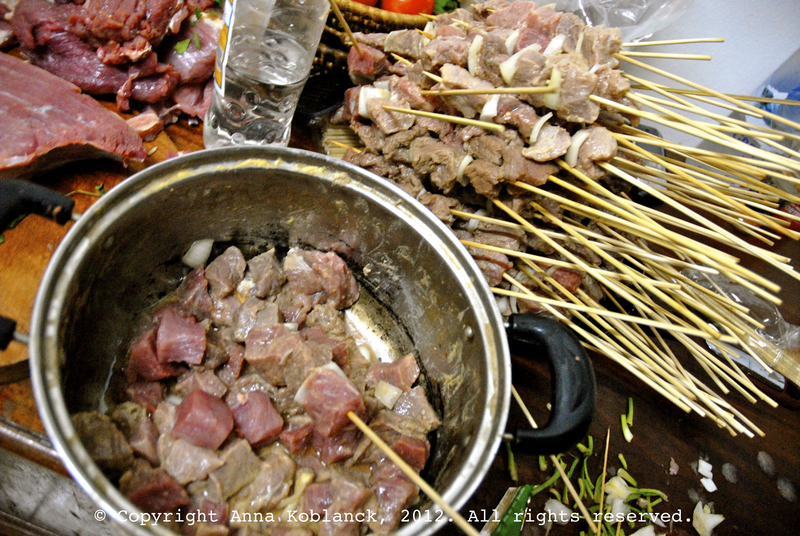 Following up on my recent trip to Rwanda, here is a recipe of Rwandan brochettes. 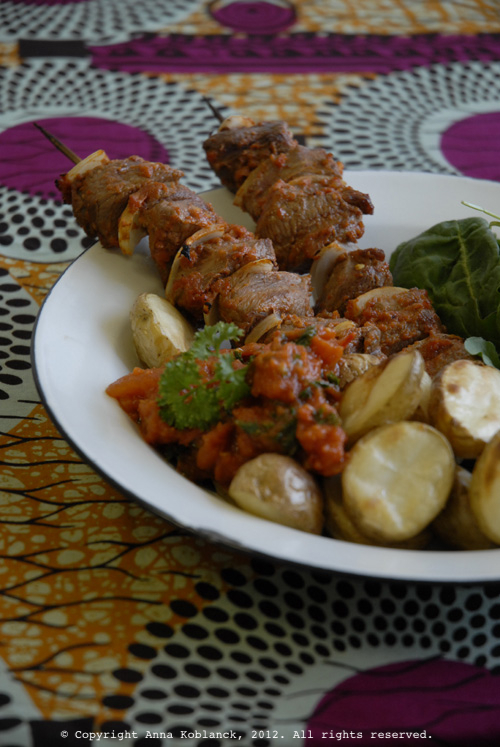 Brochette is French for skewer, and it is the most typical Rwandan dish. It is served in restaurants with potatoes, or as snacks at street stalls and cabarets (bars) with a Primus or Mützig beer (preferably warm, not chilled). Brochettes are most often made with goat meat, but you can also find brochettes with fish or chicken. The meat is usually cut in quite small pieces, mixed on the skewers only with pieces of onion (this is a good idea since vegetables and meat in generally have very different cooking times) and grilled until well done. They are rarely very spicy, but if you feel like adding some heat to the meat you can just add some Akabanga, a locally produced chilli sauce that is thin, orange and pure dynamite. In this recipe I have substituted lamb for goat meat, and I personally prefer to cut the pieces quite large and grill them until they are medium rare rather than well done. I also marinade the meat in a spicy, tomato sauce for some extra taste. In Rwanda you would cook the potatoes in some water first and then fry them in cooking oil so that they are soft on the inside and crisp on the outside (my Rwandan friend Pie-Pacifique makes sure the potatoes cook until they begin to fall apart before he fries them in oil as you get more crispy ‘extras’ that way). In this adaptation of the dish I suggest you bake the potatoes in the oven with the brochettes, as it is quite simple and means you cook almost your entire meal in the oven. Heat oven to 200 C. Cut the lamb into cubes, about 3×3 centimetres, and put aside. Put tomato pure, fresh chilli, one onion, the garlic cloves and the olive oil in a mixer and blend to a smooth paste. Put 4 table spoons of the paste aside in a small pot. Mix the lamb with the marinade and let rest for a while (an hour is good, no need to put it in the fridge). Cut the potatoes in half or in quarters depending on size, place on a baking tray with the flat side upwards, spray or sprinkle with olive oil, salt and pepper. Place in the middle of the oven so that you have enough space to put the brochettes on a tray above later on. Bake for 25 minutes. Cut the onion in small pieces and tread the lamb cubes and onion pieces on skewers, alternating between the two. Place the brochettes on a grill rack on top of a baking tray, and spread any leftover marinade on top of the brochettes. Place the brochettes above the poatoes in the oven when the potatoes have baked for 25 minutes. Turn the brochettes after 7 minutes, and let them cook for another 7 minutes. Then switch to the grill function and grill the brochettes for 3 minutes on each side, or until they have a nice, brown colour. The potatoes remain in the oven the whole time. During the time that the brochettes are in the oven you dice the tomatoes and add to the pot with the marinade you put to the side. Bring to a boil and add the chopped Italian parsley, then let it simmer on low heat until the brochettes and potatoes are done. Serve brochettes, potatoes and tomato sauce with a green salad, or a coleslaw salad which is very popular in Rwanda. 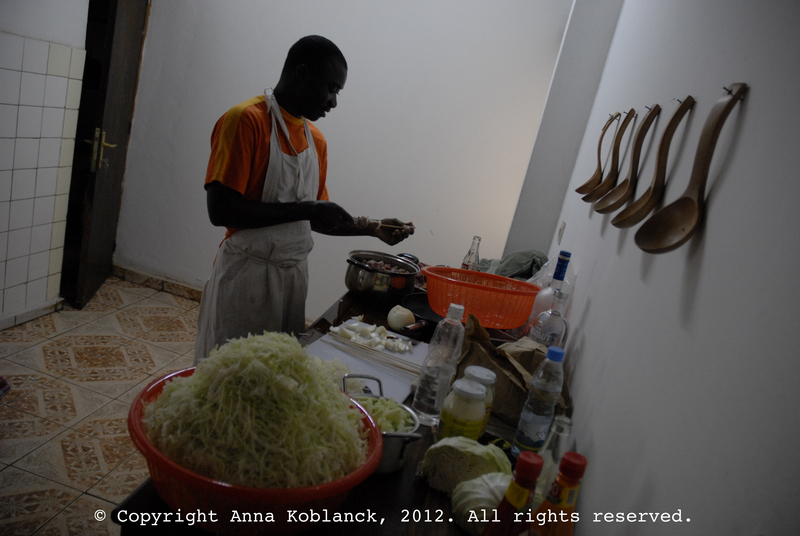 Party preparations in Kigali, brochettes and coleslaw in the making. The report provides verified useful to me. It’s really useful and you’re simply obviously really knowledgeable in this region. You have got opened up my own eye to various views on this particular subject matter using intriquing, notable and reliable written content.